TRI’s analytical laboratory has been accredited by the American Industrial Hygiene Association – Laboratory Accreditation Programs (AIHA-LAP, LLC) since May of 1980 (Laboratory Number 101505). The AIHA-LAP, LLC stringently reviews all quality aspects of the laboratory every two years. Their review includes evaluation of management, staff qualifications, training, equipment, laboratory space allotments, hygiene, safety, communication, records, equipment calibration, maintenance and repair . When a laboratory is accredited by the AIHA-LAP, LLC, the laboratory and its clients have the assurance that the laboratory has met defined standards for performance based on examination of a variety of criteria. The AIHA-LAP, LLC IHLAP is the largest program of its kind in the world and has been in operation since 1974. 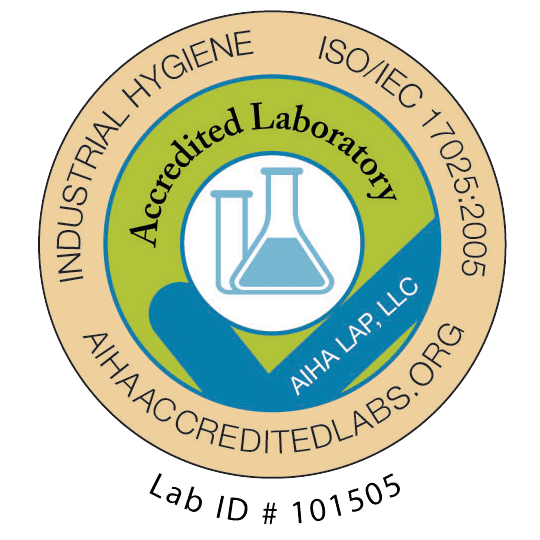 When an IH laboratory is accredited by AIHA-LAP, LLC, it becomes part of an elite group of laboratories achieving and maintaining a high level of professional performance. TRI’s scope of accreditation specializes in Compressed Air Testing. Who Tests the Air Testers? TRI Air Testing, Inc. Vice President, J. Michael Carlson decided several years ago to answer the question, “Who Tests the Air Testers?” Working with the American Industrial Hygiene Association (AIHA) proficiency testing sub-committee, Mr. Carlson, with input from three other founding laboratories developed and is currently administering the Compressed Air Proficiency Testing Program (CAPT). Approximately a dozen air testing laboratories participate in the round-robin compressed air proficiency testing group. The unknown air sample is prepared by an ISO-9000 registered gas supplier. By participating in quarterly Compressed Air Proficiency Testing Program (CAPT) we are able to compare our test results of an unknown sample of air to the test results of other participating laboratories throughout the World.